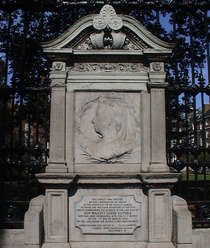 This tablet was erected by the Corporation of London in the mayoralty of Sir Marcus Samuel to mark the western boundary of the City and to commemorate the occasion of the last visit of Her Majesty Queen Victoria who was here presented with the city sword on the 7th Day of March 1900 by the Lord Mayor Sir Alfred James Newton, Bart. Carried out under the direction of the County Lands Committee. Claudius George Algar, Esq., Chairman, December 1902. 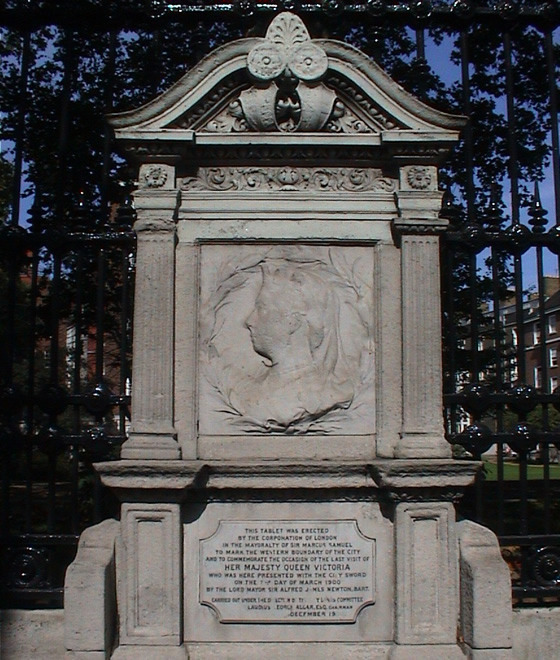 Victoria died on 22 January 1901, less than a year after this last visit to the City. Chairman of the County Lands Committee of the City of London in 1902. Mayor of the City of London in 1900.